Check out the latest addition to our shop: a fantastic 20 foot, 4-plug extension cord. 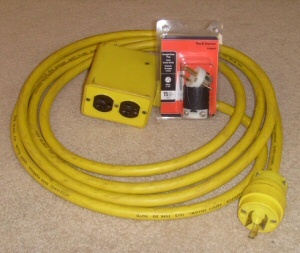 Our good buddy Chuck rescued four of these heavy-duty extension cords just before they were chucked into a local dumpster. Apparently, during a remodel these cords were no longer useful because they weren’t long enough for the new configuration. The only issue with our new extension cord is the plug on the end, which is a 20-amp 3 prong locking-style plug. If you squint on this picture, you’ll notice that the brown receptacles on the other end each bear a sideways “T” for their left plug, indicating they can handle a 20-amp load. We don’t have a locking-style 20-amp receptacle anywhere, so we’ve decided to replace the 20-amp plug with a traditional 3-prong 15-amp plug. The only potential danger here is that we’re not going to change out the receptacles with 15-amp receptacles to save on cost. If you were to plug in a 20-amp tool, you would blow the breaker on any 15 amp circuit you were connected to. This isn’t really a danger for us since (a) we don’t own any 20-amp tools, (b) we’ll tell people when we loan them the cord, and (c) it doesn’t pose a significantly greater risk than the existing risk of plugging in two 10-amp tools and using them simultaneously. Step 1: Remove the screws holding on the original plug end, and pull away the cover. Step 2: Loosen the screws holding the wires and pull off the plug so that only the insulation and bare wires remain. Step 3: Put the new plug housing on the existing wire and tighten the wires into the new terminals. Note the convention: Black wire -> Gold terminal; White wire -> Silver Terminal; Green Wire -> Green Terminal. (great tip 1shotrising). Step 4: Pull the plug housing toward the front of the plug and tighten everything in place. You’re done! Make sure you use a plug appropriate for the wire. In this case, we’re moving to a lower-amp plug, which is safe. You wouldn’t want to take an extension cord rated for 15-amps and put a 20-amp locking plug on it. The cord might overheat during us, posing a fire hazard. What do you think? What’s the latest thing you’ve rescued from the dumpster? I am a completely unrepentant trash picker. Just this morning I snagged two perfectly good plastic clothes bins (like you use for carrying things to and from the laundry) from my neighbor’s trash. I plan to clean them up and use them for toddler toy bins. A few weeks ago I stopped to pick up what I thought was a smaller storage bin and found that it contained probably 50 or more almost new or unopened bottles of acrylic paints, plus brushes, stencils, and other craft items, all in unused or barely used condition — elder granddaughter was in her glory with that find! We have so many “trash picked” items in our house it’s hard to even remember them all: A beautiful old dresser with gorgeous hand-carved wood handles, a 1930’s bedside table, a rocking chair, and a large fish made up of various bits of carved wood and old tool pieces which hangs in our garage are the ones that come first to mind. We regularly provide “trash-pick” opportunities as well, and we keep a permanent sign in our garage that says “Free/Gratis” that we often set out with clothes, furniture, scrap wood, and many other items that may be useful to others. And if your asked me to name what we’ve gotten through Freecycle, this post would be five times longer! I’d recommend a big tag attached to this cords to remind users that they can only be used for 15 amps. Anyone that picks up that chord will think it’s rated for heavy use. If you had those on a job site you could be fined by OSHA for a serious electrical violation. Just curious why you didn’t buy 20 amp plugs? You might want to tell them that the convention for 120V plugs and receptacles is: black wire-gold terminal, white wire-silver terminal, and green wire to green screw, particularly if you’re only replacing one end. If you cross the wires and plug into another cord, you’ll be short. @Todd – I’ll be sure to let you know if OSHA shows up on one of our DIY work sites… I do plan to sharpie-on a “15 AMP ONLY” warning when I get around to using the cord. I didn’t buy a 20-amp plug because all of the 20-amp models are locking-style for this type of application. Even if I were able to find the traditional “sideways-T-style” outlet, most DIY work spaces lack 20-amp circuits, or, if they have them, they don’t have the sideways-T-style connector (this is frequently true in kitchen 20-amp appliance circuits). I might eventually change out the receptacles in the cord, but as I said in the post, this would basically result in a waste of two perfectly good 20 amp receptacles. 1shotrising: Excellent point. I’ll update the post. Very helpful info for any novice replacing the plug on heavier-duty, grounded cords. Our community has biannual “large item” garbage pick up, with homes encouraged to set items near the curb several days in advance to allow “pickers” to sort and take what they want. One man’s trash is another’s treasure! I’ve found that the best place to get the plugs is the electrical supply stores. The big box stores may be cheaper on a given day, but if you watch the supply stores their prices can change day to day based on demand, and I think you get a better quality product.